At the start of 1997, the world had just gone through a year that included a bombing at the Atlanta Olympics, the arrest of Ted “The Unabomber” Kaczynski, a deadly terrorist attack on a U.S. military base in Saudi Arabia, and mass shootings at both an Australian tourist site and a Scottish primary school. Meanwhile, when the new year began, NBC’s hit sitcom Friends launched a new storyline, which had Rachel Green quitting her job as a coffeehouse waitress and landing a position in the fashion industry, ultimately straining her relationship with her boyfriend Ross Geller. This was a widely watched, memorable arc for Friends—the kind that people who paid attention to TV back then still bring up when they talk about the pop culture of the ’90s. It’s true that anybody who watches those episodes now wouldn’t get much inkling from them about any violence or strife that was happening elsewhere in the world. But to be fair, most folks who watched Friends in its original run probably weren’t thinking about that either. Or at least that’s how I remember it. I was 26 years old in the first half of ’97, and a newlywed living in northern Virginia. My wife and I had a daily subscription to The Washington Post, and spent most of our time in our apartment with the TV on and some kind of reading material close at hand. We felt well-informed, although compared to the age of Twitter, our access to breaking news was primitive. Perhaps as a result, unlike in 2017, we didn’t spend all day feeling constantly on-edge and mildly queasy… even if, in retrospect, perhaps we had reason to. That’s why watching Friends now—at least for those of us who remember the first time the episodes aired—isn’t just an exercise in pining for a prettified, fictionalized version of New York yuppies. It also provokes nostalgia for a seemingly more sedate, less persistently nerve-wracking way of life. As silly as it seems to say now, what did make us anxious back then was television. In the waning years of the ’90s, before The Sopranos debuted on HBO and initiated the age of prestige, the major networks were in the middle of their own mini-Golden Age. In 1997, even viewers without cable subscriptions could watch The X-Files, The Practice, The Simpsons, King Of The Hill, Ally McBeal, Buffy The Vampire Slayer, NYPD Blue, Murder One, Everybody Loves Raymond, Mad About You, Roseanne, NewsRadio, Frasier, Dawson’s Creek, The Drew Carey Show, Seinfeld, Law & Order, Chicago Hope, ER, and Homicide: Life On The Street. We were a few years away from the intense, “can’t miss an episode of you’ll be lost” serialization becoming the norm for TV storytelling. But a remarkable number of the shows above did rely on subplots to keep fans hanging on—sometimes nervously—from week to week. The enduring popularity of Friends is due in part to how comforting it is to drop into its universe, and to shut out anything happening outside the frame. But the reasons for that have a lot to do with how adroitly the writers combined serialization with episodic “one and done” plotting. In fact, each Friends half-hour is so plot-driven and individualized that the titles make a joke of it: “The One Where No One’s Ready,” “The One Where Rachel Quits,” etc. Yet telephiles who switch on a random episode today can quickly situate themselves in the era of Friends they’re watching, and not just by tracking hairstyles, fashions, or actor Matthew Perry’s fluctuating weight. Instead they look at which characters are coupled up (and with whom), who’s living where, who’s pregnant, and where everybody’s at in their careers. It’s easy for fans to watch a whole block of Friends episodes on cable or on streaming without even realizing how many in a row they’ve consumed, because one connects so easily to the other, with so many active arcs to follow. Consider the Ross/Rachel romance. 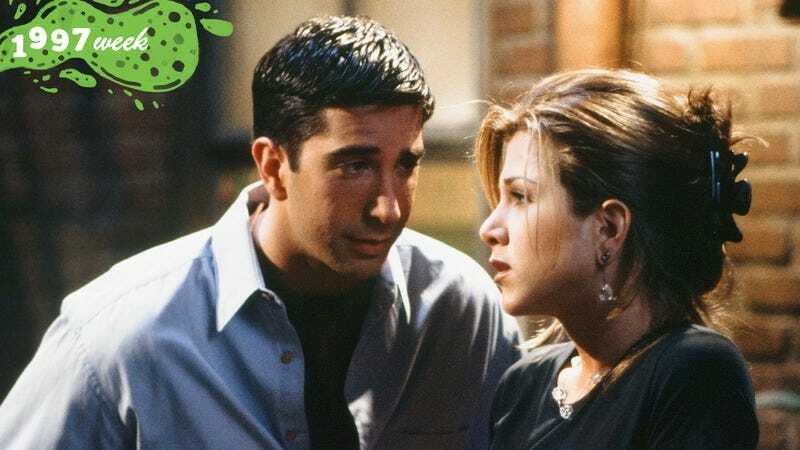 The first episode of season one brought Rachel back into the lives of the gawky Ross (played by David Schwimmer) and his sister Monica (Courteney Cox), who had been friends with her when they were kids, before she drifted away to the popular crowd. The first season ended with Rachel learning Ross had a longstanding crush on her, which she decided to reciprocate—but only after he was already with somebody else. In the middle of season two, all the obstacles to their relationship cleared away, and they finally coupled up; but trouble started to sneak in at the start of the third season, as they began to bicker more. The obvious model for all this “will they/won’t they?” with Ross and Rachel was NBC’s ’80s sitcom smash Cheers, which got a lot of mileage out of a winding romantic story arc during its first five seasons, when bartender Sam Malone and barmaid Diane Chambers kept breaking up and making up. Other sitcoms had worked within a semi-serialized form before—including I Love Lucy for lengthy stretches, and Green Acres, The Beverly Hillbillies, and Soap throughout most of their runs—but Cheers mastered a method of fitting a love story in and around fully realized individual comedic episodes. The actual break-up doesn’t happen in “The One Where Ross And Rachel Take A Break,” though. The big split comes in the follow-up, “The One The Morning After”—one of Friends’ finest half-hours. The episode starts with what looks like a reprieve for Ross, as Rachel drops by his apartment to apologize and reconcile, and doesn’t even notice that Chloe’s still there, getting dressed. But then Chloe tells her co-worker Isaac about the liaison, and Isaac passes the info along to a woman who’s a roommate of Gunther, Rachel’s former coffeehouse boss and not-so-secret admirer. In the second half of “The One The Morning After,” the couple has an epic, hours-long fight back at her apartment, unaware that Monica and their friends Chandler Bing (Perry), Phoebe Buffay (Lisa Kudrow), and Joey Tribbiani (Matt LeBlanc) are all listening in from a nearby bedroom, unable to leave lest the situation get any more awkward. In their commentary track on the DVD and Blu-ray of “The One The Morning After,” Friends co-creators David Crane and Marta Kauffman, along with their producing partner Kevin S. Bright, talk about the challenges in taking a moment of such series-changing drama and making it funny. One of the keys—besides having the accomplished director James Burrows steer the shoot—was having the other characters be eavesdroppers. The producers say that one of the fundamental principles they adhered to when writing the show was to “keep the dialogue present,” meaning that rather than advancing the story with a lot of “Hey did you hear about?” chit-chat, it was always better to have the characters observing and reacting first-hand to what was happening. During production of this particular episode, Kauffman says that no matter how many hilarious bits of business they added to the Ross/Rachel argument, it didn’t play as comic until they cut in the reactions from the other room—in part because Aniston’s performance as Rachel was a little too raw and real, and in part because the situation of the breakup itself was too painfully familiar. Nearly every adult watching the episode would’ve had some kind of personal memory of a similarly awful split. Friends wasn’t exactly admirably realistic. The characters somehow lived in a New York City with very few gay folks or people of color; even in “The One The Morning After,” the supporting characters seem to have been teleported in temporarily from some other unrelated piece of popular culture. Isaac—who’s like a grunge hippie that learned how to talk from Sean Penn’s Spicoli in Fast Times At Ridgemont High—comes off as especially cartoonish and out of place. But the show had a subtle verisimilitude, generated by small details. Specific elements of the decor would carry over from episode to episode, like Chandler and Joey’s oversized entertainment center, or would position the story seasonally, like the tiny piles of snow accumulating on the outside of Monica and Rachel’s slanted windows. Some of the intrusions of reality were unintentional, such as the simple transition shot of the World Trade Center towers in “The One The Morning After,” which is a reminder of a New York transformed by 9/11—an incident that occurred just before the debut of Friends’ eighth season. Friends doesn’t feel like the kind of show that aired three full seasons post-9/11. That’s neither criticism nor praise; it’s just a note about what Friends was. It was escapism, pure and simple—and so slickly produced and compelling that even millennials too young to have seen the original run have come to love it in syndication. I was on a 24-hour bus ride recently with my son’s high school choir, and overheard two of his peers engaging in a long and passionate conversation about their favorite Friends characters and episodes. These kids were born around the year 2000—three years after “The One The Morning After” debuted. That’s a testament to how sturdily this show was constructed. A program that intended to entertain people for a half-hour each week did, at its peaks, become not just involving, but spellbinding. Over 28 million people watched “The One The Morning After” the night it aired; and many of them probably expected to see the series’ central relationship reaffirmed. Instead, they were shown, with each cringe-inducing exchange between Ross and Rachel, that some ideals are too fragile and fleeting to survive.